This is a very beautiful shallow reef, also a favorite for night diving. The dive masters have been feeding the fish here, so you will find most of them quite tame. The reef area is covered with sea fans, sea rods and sea plumes, swaying back and forth in the light swells. 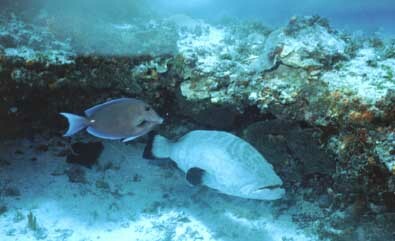 Pillar corals reach up towards the surface and clouds of brown chromis will part when a diver passes through. When the food comes out, the whole fish population gathers around the divers, and one might may actually risk being bitten by the more aggressive sergeantmajors. At night other residents of the reef, like lobsters, crabs, and octopuses take their place, and basket stars climb on top of the sea fans and coral heads to spread out their arms to catch the plankton they feed on.